and Two Pavilions. Restroom Facilities Available. The Pavilions may be reserved for private parties. This 9-hole golf course attracts golfers from all over South Texas. The short and very scenic course is excellent for beginners. A modern sprinkling system helps to keep the fairways and greens in top condition for year-round play. The course plays to a maximum 6,000 yards, with ladies tees playing to approximately 5,000 yards. Tournaments are held throughout the year by the Weimar Golf Association and private groups. In addition, there are two softball fields, public picnic grounds and a fishing pond. 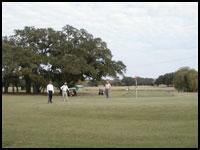 The Weimar Golf Club is located in Hill Memorial Park, one-half mile east of Weimar on U.S. Highway 90. The Weimar Golf Course began in the early 1920's. Mr. Tom Hill and Mr. Hans Brasher started playing golf with 3 golf holes in the middle of a cow pasture that over the years evolved into the present 9 hole format. In the late 1930's the original nine holes were developed with circular sand greens. Sand greens were approximately 15 feet in diameter and the sand was oiled with used motor oil to give it a heavier texture that could be smoothed with a 2" X 30" pipe drag. Shortly after World War II (1949) several of the returning veterans decided to relocate and build new grass greens. With volunteer labor after hours and on weekends, with free use of County and City road building equipment this task was completed in one year. In 1967, Thomas E. Sparks and Ethel E. Sparks gift deeded the land (110 acres) to the City of Weimar for recreational use only. At this time, the Golf Club management decided to expand the facility by vacating 3 greens on the west side of the intersecting creek and replacing them with three greens on the East side of the creek to open up the course and eliminate the hazard of golfers being hit by golf balls. In 1987, the management team decided that we needed a stronger management team with continuity, so we opted for becoming a tax-free Recreational Corporation known as the Weimar Golf Club, Inc. with 7 directors. The President, Vice President, and Secretary and Treasurer are elected from within the Board of Directors each for a one year term. The Weimar Golf Club, Inc. is affiliated with the Texas Golf Association and the United States Golf Association. The Board of Directors is governed by the By-Laws and golf play is governed by USGA rules. The Weimar Golf Club has four employees, two that manage the clubhouse, and two that maintain the golf course and equipment. With the help and cooperation of the City of Weimar, the Weimar Golf Club has been able to operate a recreational facility that has become successful and a definite asset to this community.